Organising a meeting or private dining occasion? Book our modern meetings rooms or suite of charming Heritage Rooms with a click of a button. Find out more about our values and what's important to us. From our membership and awards to our CSR and stance on the environment and sustainability. Behind every event at 30 Euston Square is London’s leading catering team. We develop innovative food concepts, bespoke menus with exceptional service to make every occasion special. Experience the best in audio-visual technology, understand what’s included and where. The recently upgraded facilities include the latest and most practical equipment available. Our approach to Corporate Social Responsibility is an important part of the way we do business at 30 Euston Square. We aim to have the best talent in the industry. Find out more about our team and how their experience will ensure your event is truly memorable. We believe every event is different and important, our aim is to ensure guests are satisfied. Don’t just take our word for it, read what our recent clients had to say. A wide variety of attractions can be found nearby including the Boomsbury Theatre and Regent's Park, home of London Zoo. Camden Market, Madame Tussauds and Oxford Circus are all within a 20 minutes walk of the venue. 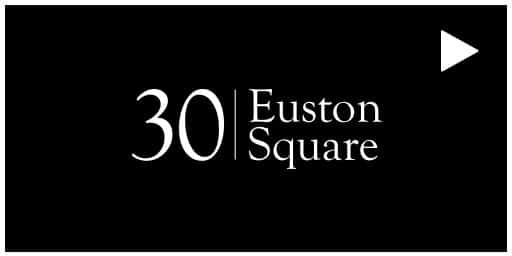 30 Euston Square sites next to the A501 - a main artery serving much of North London - and can be accessed easily by road from the centre of the Capital. The A1, A5, A40 and A41 can all be reached within a few minutes drive of the venue. Our interactive map shows travel times to UK mainline stations and airports. Paric and Brussels are just over 2 hours away by train from King's Cross St Pancras so we are never too far away.